We have come to expect great things from T-Mobile and today was no different. 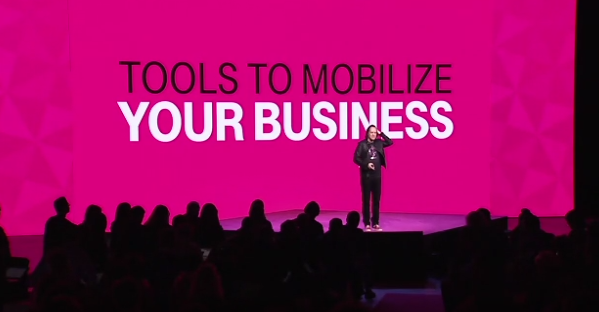 During the 9th Un-Carrier event, T-Mobile CEO John Legere announced some huge changes to how they will operate with businesses. The introduction of some massive changes will surely make changes to how all carriers handle their business. Their first announcement was “Our Best Price Is Our Only Price“. In a bid to stop businesses having to haggle over prices with their carriers, and ensuring even smaller companies get the same price as larger ones, T-Mobile has introduced a simple pricing system. Each line comes with unlimited talk and text and 1GB of LTE data for just $15. The second announcement was on how their users would buy extra data for those lines. There are two options here, the first being adding data per line and the second being pooled data. For $4.75 per GB, you can add data to either one or multiple lines. The purchasing of pooled data allows your company to consume data all from one ‘pot’. The important thing is that there will never be any overage charges, even if your lines go over their allotted data you are still only charged $4.75 per GB. Stating the statistics that 56% of consumers do not trust a business without a website and that 50% of businesses don’t have a website at all, as soon as you buy a single business line from T-Mobile you will receive a free .com domain and mobile optimized site courtesy of GoDaddy, who T-Mobile have gone into partnership with. T-Mobile claims that they will even help you build it, and they will also give you a custom .com email for each line. Simplifying the way family discounts work, anyone with a family member using a T-Mobile business line will be eligible for a straight up 50% discount from their bills. In addition, they will now cover the costs of you leaving your current contract, including your phone plan for up to $650 and also includes leases. Finally in a surprising move, they have “brought contracts back”. Their new UN-Contracts will never increase in price and all previously promotional prices are now permanent. John used the example of the five million people who bought the ‘Four for 100’ plans who now can keep their plans at the current price for as long as they are customers of T-Mobile. The prices of all contracts will now never increase, however they did make a big deal of mentioning they could come down in price. As for unlimited data plans, he promised that the data will not decrease and the price will not increase for a minimum of two years. It will certainly be interesting to see how other carriers react to these offers. Without some major changes, we could see T-Mobile make their business sales rocket dramatically. These new plans and incentives really increase their approachability, and smaller companies will surely find the process of setting up much simpler with their new transparency and flat rates.